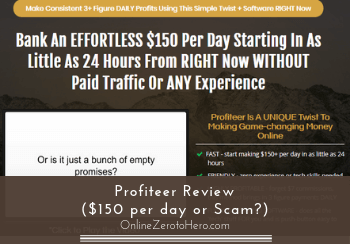 Have you come across a program called Profiteer and saw their claim that you could easily profit $150 per day? It may have caught your attention since the offer is achievable, unlike other programs you have seen in the past. But is this program a legit opportunity you can take advantage of or is Profiteer a scam you should stay away from? You’ll be able to make an informed decision about this program after reading my Profiteer review because I will share with you all the essential info about this program. 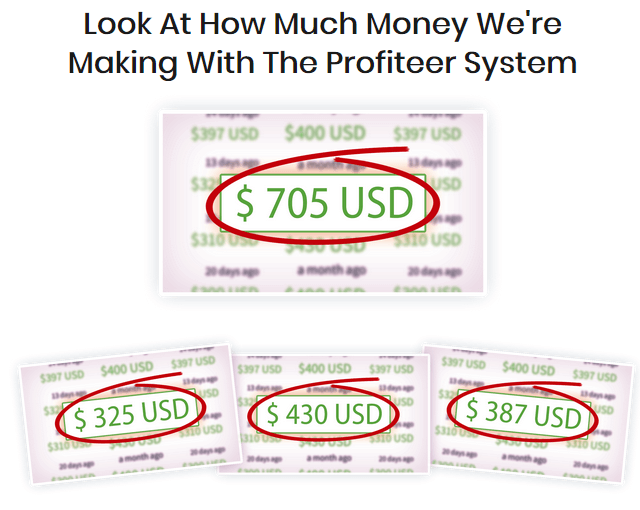 Profiteer is a program that claims you could easily profit $150 per day using their revolutionary system. This program is created by Jason Fulton and Mosh Bari, who are both veteran internet marketers, and according to them, they are earning four-figure daily income because of this system. The primary business model of this program is called website flipping, which revolves around creating niche websites and then auctioning these sites including their domains for big bucks on popular platforms like Flippa. In my opinion, website flipping is a legit way of making money online, but their recommended method is NOT the best way to do it, because they want you to use automated software to create the niche website and a spinner to re-word articles taken from other sites and use it as content on your niche website. That is why I don’t recommend this program because I found several red flags on their sales page that makes it a risky investment, in my opinion. I suggest that you look for other legit opportunities that can truly provide you the results that you are looking for. What is Profiteer and what does it offer? Profiteer is a program that promises people an opportunity to make $150 in as little as 24 hours of using it. Jason Fulton and Mosh Bari, who created this program, are both veteran internet marketers and have among other programs created Insta-Minator and the program Velocitii as well. According to them, they are earning four-figure daily income because of this new system. They also claim that you don’t need to use paid traffic or build any list since their software will generate all this for you automatically. Another significant feature of this program is that it will only take 30 minutes a day to set up everything and you don’t need any technical skills, because you will rely on a copy and paste system. One of the claims on their sales page is that their members are making 3-4 figures profits. Also, based on their sales video you can always expect 100% free traffic without the hassles of doing SEO and social media posting. These claims sound amazing, and it could really pique your interest, but after watching the sales video, I became more skeptical – especially when they said that it’s easy to make money online and you don’t need prior experience or technical know-how to succeed. In my opinion, you can’t succeed in any online endeavor if you can only invest 30 minutes of work a day because it requires more than that. If you’re someone who is looking for a way to make money online and you happened to come across this program, you would likely get excited because they might give you an impression that you can quickly get money online just by using automated systems. Seeing these income claims can capture your attention. Before you make your final decision, I urge you to read on because I will share with you some of the red flags that I’ve uncovered from their sales page. I hope this could give you a better idea about this program so you can decide if this program is for you or not. Red flag #1 – You only need to invest $12.94 to succeed in this program? 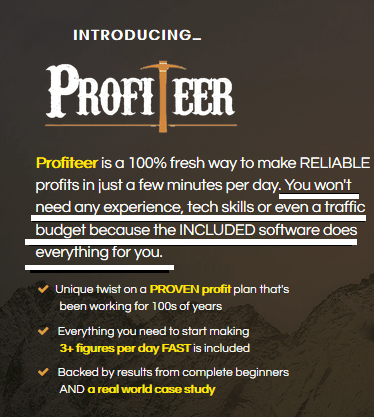 When you buy Profiteer for its initial cost of $12.94, you’ll be given access to their training materials and some case study that according to them will help you earn from zero to $852 in no time. According to their sales page, these are the steps you need to take to make money online. However, when I did my research, I found out that they are offering several upsells for clients who are already inside their program. Upsell #1 – “Done for you profiteer campaigns” that will cost you $37 but will go down to $17 due to their discount. Upsell #2 – “Advanced profiteer tactics” which generally cost $47 will go down to $27 due to discount. Upsell #3 – “Set this up on autopilot” which costs $67 but will go down to $37 due to discount. Upsell #4 – “License rights” that costs $97 but will go down to $47 due to discount. The main issue I have here is not the quality of these upsells, but the way they promote their program without giving people an idea of the real costs involved before joining in. In my opinion, they should have been more transparent in providing you with all the details including the upsells on their sales page. It’s NOT nice to lure people into a program without revealing the hidden costs, because it only gives an impression that you are selling an incomplete product, and you require your clients to buy the upsells before they can enjoy the full potential of your program. That’s why you need to consider this red flag when you’re already making your decision about this product. Red flag #2 – Is this program beginner-friendly? The primary business model of this program is called website flipping, which revolves around creating niche websites and then auctioning these sites including their domains for big bucks. Based on their sales page, you don’t need experience or technical skills to earn money online, because they have a software that will do the work for you. The whole process is a bit complicated, and newbies will definitely struggle without technical skills, but according to the creators of this program, their software will take care of everything. Profiteer claims that you could easily create a website using their revolutionary software and you can sell it on auction platforms like Flippa and WebsiteBroker. In reality, some software can create a site in under 60 seconds, but you need to understand that these are brand new, so they are not worth much unless you connect it with a domain that already has authority. Not to mention, that finding high authority domains are hard and expensive and require technical skills to achieve. A complete beginner will NOT be able to do it without proper training. In addition to this, to be able to make any money from selling a website, it already needs to have great content on it and have traffic. This is not something that will just happen overnight automatically. In my opinion, this program is not for beginners because there is a lot of technical stuff that needs to be done before you can auction the site. Also, using automated software to do the whole process for you will only produce subpar websites that no one wants to buy because it doesn’t have any traffic and authority on the web. I hope you consider this red flag before you make your final decision. Red flag #3 – Do they use a spinner for the content on the sites? Another red flag that I would like to point out is the use of the spinner in creating the content for the sites generated by their software. According to the creators of this program, you’ll be using a WordPress plugin created by Mosh Beri that will search for RSS feeds from the keywords you input on the plugin and it will generate duplicated content from various sites on the web.